It’s berry season again, and if you aren’t already munching on nature’s candy every single day you should be. Because berries aren’t just delicious, they’re also brimming with good for you nutrients that help protect and repair your body from head to toe. Antioxidant rich berries can help you fight diabetes, protect your heart, boost memory, melt away belly bulge, ward off cancer and more. Following are our four favorite health-benefit-packed berries. Oranges are always held up as the poster child for vitamin C, but the truth is a handful of strawberries will provide you with even more of this immune-boosting antioxidant. In fact, around eight of the berries will deliver your daily recommended amount of C.
Strawberries can help fight inflammation and protect your heart, brain and eyes.3,4,5 They can help raise your “good” HDL cholesterol, lower LDL cholesterol and blood pressure and balance blood sugar. Red raspberries are an excellent source of vitamin C. And this tart and delicious berry also brings a healthy amount of selenium and phosphorus to the table. Like the other two berries we’ve already covered, raspberries contain cancer-fighting anthocyanins. But the berry’s cancer-fighting powers don’t end there. Blackberries are swimming in antioxidant polyphenols, in particular potent anthocyanins and quercetin. And they’re also rich in ellagic acid and vitamins C and E.
Berry season flies by so fast if you blink you might miss it. 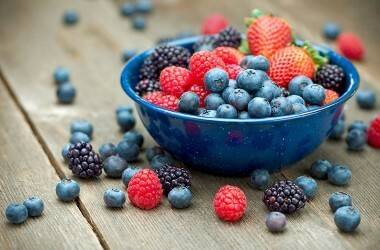 Don’t wait until it’s too late, stock up on nutritious and delicious berries today!